Live a unique experience: living in Palazzo della Scimmia (the Monkey Building), one of the most famous buildings in Rome. Live a unique experience: living in Palazzo della Scimmia (the Monkey Building), one of the most famous buildings in Rome. 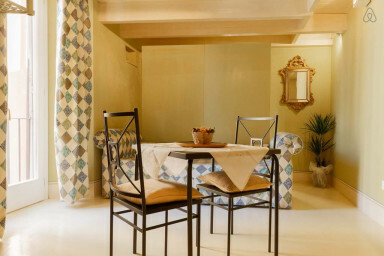 Comfort, charm and design in a precious historical context a few minutes walking from Navona Square. The 1500's Palazzo Scapucci (Scapucci Building), built around the Medieval Frangipane Tower, is a perfect union between old-fashioned beauty and modern comfort. Our apartment, on the third floor with lift, will fascinate you at first sight. Don't miss the chance to make a unique experience: living for some days in Palazzo della Scimmia (the Monkey Building), one of the most famous and iconic buildings in Rome. Comfort, charm and design in a precious historical context a few minutes walking from Navona Square. The 1500's Palazzo Scapucci (Scapucci Building), in via dei Portoghesi (Portuguese’s Street) was built around the Medieval Frangipane Tower. Very well preserved, today it is a perfect union between wisely emphasized old-fashioned beauty and modern comfort integrated with aesthetic elegance and a great result. Our third floor apartment (reachable by stairs or a modern lift) is full of charm and will fascinate you at first sight. The owners, a couple whose passion (and then profession) is the attention to detail, made this two levels loft a real jewel, then decided to share it with the lucky guests who wish to book it. Blue and pastel green colours meet the dark wood of poor art furniture, the precious tapestry, the essential white kitchen. From the window of the living room you’ll see the enchanting Baroque facade of Sant’Antonio dei Portoghesi (Saint Anthony of the Portuguese) church: a living painting. An adorable spiral staircase brings to the landing, where you will find a useful closet and a romantic bedroom. The bathroom, on the ground floor, includes a large shower placed in a recess in the wall. Nothing is left to chance, from furniture to the plasters of rare quality. A precious stone, perfect in this context. The Monkey Palace owes its strange name to a story. According to the legend, made famous by the American writer Nathaniel Hawthorne in its notes from a trip to Italy, the owners of the tower lived there with their newborn girl and a pet monkey. Maybe out of spite, jealousy or for fun, one day the monkey picked the baby up and brought her on the top of the tower, dangling her dangerously. The terrified parents, while attempting to call the monkey back in every way, made a vow to the Virgin Mary, asking for the salvation of their daughter. The animal finally decided to climb back down the tower and return home, giving the baby back to mum and dad. Even now, on the top of the building, there is a beautiful statue of the Virgin Mary with an ever-burning lamp, as an homage for the grace received. This building is so peculiar and interesting, also from an architectural point of view, that it became the Roman house of Liz, the main character of the movie Eat Pray Love, starring the Hollywood actress Julia Roberts, who became a habitué of the neighbourood during the shooting. Pictures of the actress are hanging on the walls of the barber shop at the bottom of the tower in which every day the barber shaves and cuts hair to more or less famous, but definitely very demanding customers.